Major Islands: (from east to west) Timor, Alor, Lomblen, Flores and Sumba (plus Komodo which we cover on our Komodo & Rinca page). Language: Bahasa Indonesia. In Timor: Tetum, plus 14 other languages. 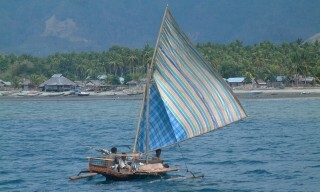 On Flores and Lembata: 5 regional languages. Population: Mainly of Malay and Melanesian descent. Multiple ethnic groups. 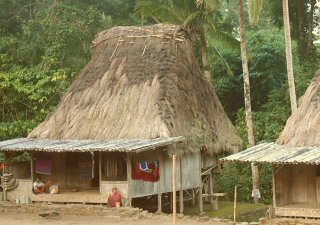 Religion: About 85% Christian (more in Timor and Flores), sometimes thinly veiled over animism. 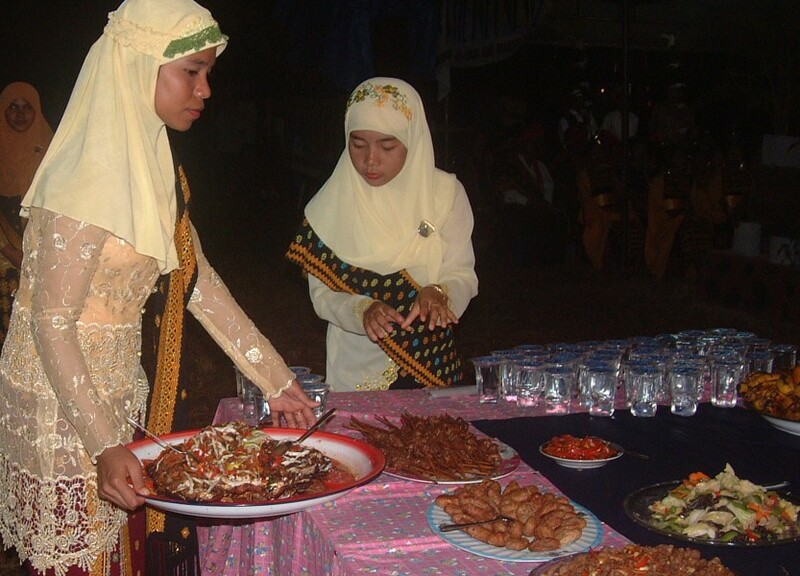 Small Muslim populations in coastal fishing villages. Money: Rupiah, with an exchange rate of about Rp10,000 to US$1 in 2006. Landscape: Mountainous terrain, including active volcanoes. 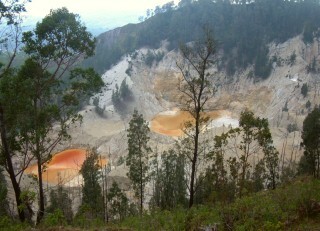 Dry scrub and forest, affected by winds from Australia. 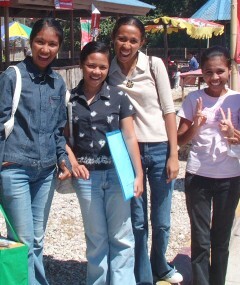 Visited: Timor, Lomblem, Adonara and Flores from 26 July to 25 August, 2006. Local History: The earliest peoples of the island of Flores were probably under the rule of the Makassarese and Bugis peoples from Sulawesi to the north. The northerners took slaves from Flores, and plundered the islands for sandalwood, cotton and cinnamon. 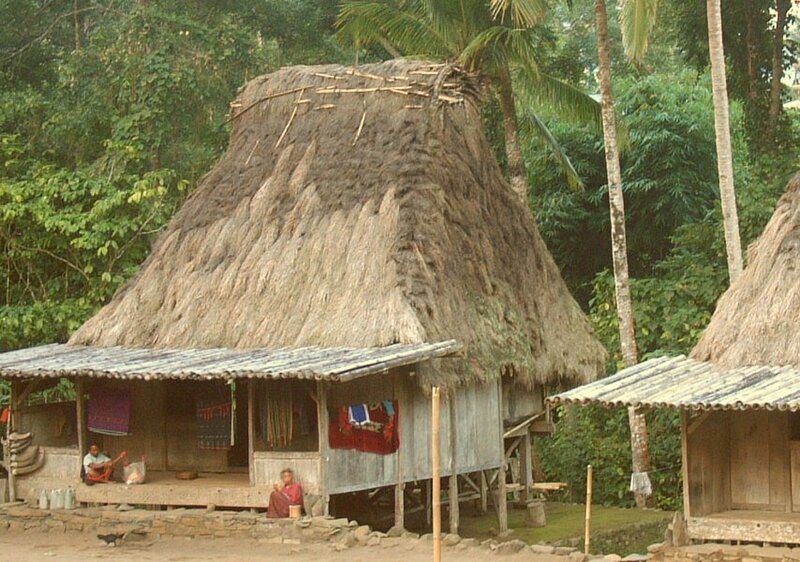 In Timor, the Tetum peoples formed many small tribes which were constantly at war. Headhunting in all the islands was common. The Portuguese arrived in East Nusa Tenggara in the mid-16th century and were quick to exploit the area for its sandalwood. 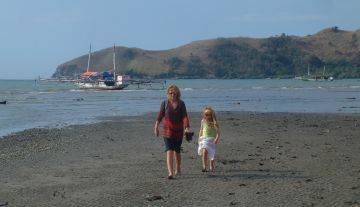 Forts were built and Catholic missions started on both Flores and Timor. One century later the Dutch arrived and the area changed hands but they struggled to control the ethnically diverse and geographically challenging islands. On Timor, the Portuguese retained control of the eastern part of the island while the Dutch (bringing Protestantism) remained in Kupang with its excellent harbor. After WW II Indonesia attained independence from the Dutch. Eastern Timor, still closely aligned with Portugal, fought a bloody war to attain its independence from Indonesia 50 years later, thus dividing the island of Timor into a province of Indonesia and the new country of East Timor. Indondesia's Timor (with its capital in Kupang) still struggles to overcome the world censorship of its role in that civil war, and tourism is at an all-time low. 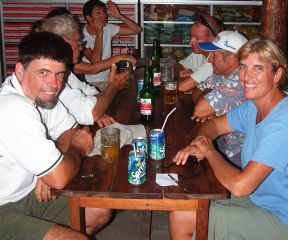 (Sue) The idea of cruising Indonesia has been in my mind for over 25 years, and it was thrilling to know it was coming to pass in 2006. 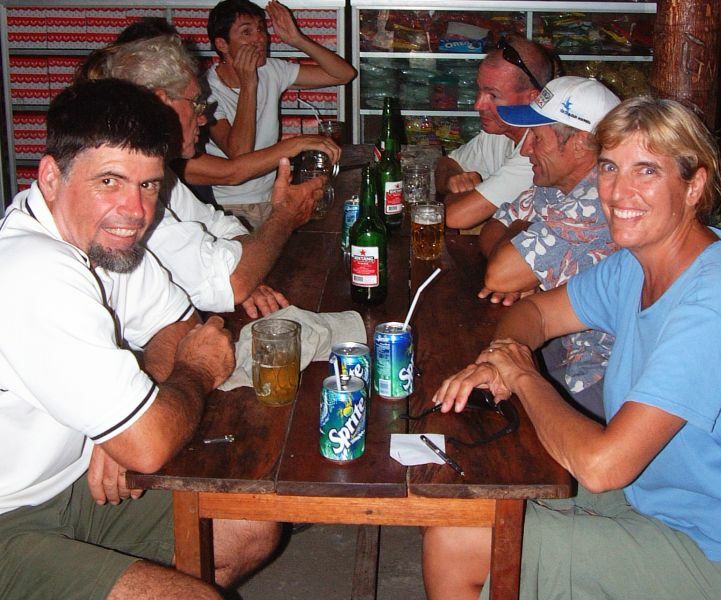 The choice to join the Darwin-Indonesia Rally was not an easy one as we had always prided ourselves on being independent cruisers, ones to avoid the crowds and cattle-herding sense of being part of a group of cruisers. But the promise of cultural events, dinners, outings, and a chance to meet (we hoped) some other boats with teens aboard let us join the Rally with enthusiasm. Arriving in Kupang we immediately felt the advantages of the Rally. Not only had the whole beach at Teddy's Bar been cleaned up for us, but the Rally organizers had hired young university students to act as our hosts and guides. The friendships we made with these intelligent, cheerful and kind young people gave us the best-ever introduction to this huge and varied country of Indonesia. Each morning they met us on the beach to ask what we needed, where we wanted to go, what we wanted to see. They traveled with us to internet cafes, museums, homes of relatives and the Timorese people who did weaving as a cottage industry, and to the malls to shop. When the Rally took large groups of cruisers to local villages and into the countryside, the students were always with us as guides and translators. These personalized our experience in West Timor in the ways that no tourist brochure or history books could have. When we invited Reny, Ivon, Lidya and Nita to Ocelot for a short sail to tiny Monkey Island offshore Kupang they were enthusiastic. We had a lovely day of beach walking, pizza lunch, laughs and conversation. Unfortunately the winds were quite strong making a choppy sea, so we had to cut the day short. The girls later thanked us profusely, saying it was a once in a lifetime experience -- and that they now know they are not boat people! 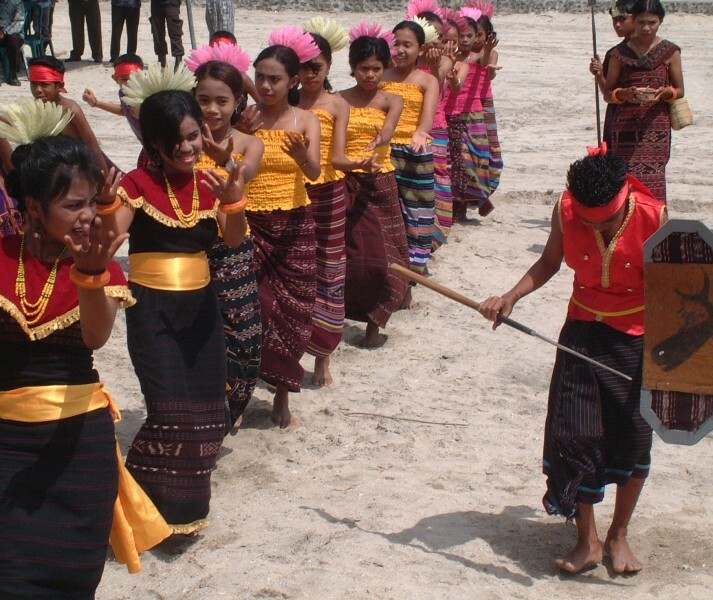 Lembata welcome dance, the girls in ikat. While the Rally went on to Alor, we stayed a few days longer in Kupang to tend to the business of getting fuel, helping to set up a scholarship fund for university students, and exploring the city on our own. From there we went to the island of Lomblen (shown as Kawula on the charts) where we caught up with the Rally once again. Although the small, dusty town of Lewoleba is well off the beaten tourist track, they laid on an incredible welcome for all of us. Met on the newly cleared grounds by the harbor, we were given an official welcome in the form of dancing, singing and beetle-nut ceremony. The village headman poured water on the ground to symbolize the joining of two peoples, then we were invited to partake of the lime and beetle-nut (we declined). We were then all invited to climb aboard either motor-scooters or bicycle rickshaws for a ride through the town -- WE were the parade -- to city hall where we were given cold water and boxed snacks while being officially greeted by various bureaucrats of the city, island, and region. The people of Lewoleba were humble, honest and warm; they were especially interested in how we liked their town and island, constantly asking us for advise on how to improve their image for tourists. Despite troubles with the buses they hired (flat tires being common) the guides were eager to please us, and went out of their way to make us feel welcome. One lovely day was spent outside the town where we walked the dirt paths through a Muslim fishing and seaweed farming village, where the local cemetery had gravestones of both Christians and Muslims. 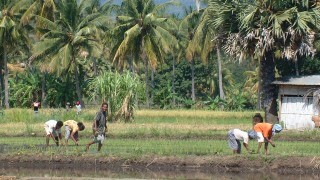 We bussed into the hills and were invited to walk through rice paddies and farmland. The farmers invited us to try their homemade rice wine -- milky white and quite searing on the throat! The gorgeous scenery of volcanoes, palm trees and wet rice paddies with the farmers bent over their tasks gave me a jolt of reality: I had truly arrived in long-imagined Indonesia! at the "mosque cafe" in Lembata. (Amanda) Kupang was a fun, funky introduction to Indonesia. The 'beach' was all gravel and we paid 20,000 rupiah a day for some guys to lift our dinghies up it and down it and look after them all day. That's $2/day and we eventually realized they were ripping us off but there wasn't much we could do about that. Food at Teddy's Bar was cheap and easy, and for the first while we hardly ate on the boat. It was just too easy to stay ashore and be with all the yachties and the university students. There was always something going on, live music (though it wasn't always put on for us) singing groups, speeches, dances... We learned more about Indonesian speeches as we progressed through East Nusa Tenggara... the record minimum time I think was 10 minutes. One guy in Lembata rambled on for a good half hour, all in Indonesian. The gist of it (I think) was thanking us for coming to see their beautiful island, telling us about all the things we could see or do, and apologizing profusely if anything wasn't to our liking. surround them in Ciendah. Note "spider boat" offshore. Everyone was happy to see us, and greeted us with big smiles (as they mentally upped their prices at least 40% if not more). Having the students around to argue in the market was good, though most of the time the difference between 'local' price and 'foreigner' price was a matter of cents. Sometimes, walking through town (always with at least one other person) I'd get asked to pose for a picture with someone. It was annoying, but it was worse for the young girls we were traveling with on Estrela and Vagabond Heart. They're absolutely adorable and got swamped by people wanting to touch their hair, their face, ask questions, etc. Cheerful kids. "Hello Mister! Where you from?" After several anchorages off towns or villages, with people ashore and paddling out to see the boat, it was wonderful to anchor at a little island off Adonara. There was a small pearl farm there, and occasionally someone would come out to check it, but basically for several days we were left alone. It was wonderful... and it was a beautiful anchorage too, if not exactly tenable in very much wind. The snorkeling was okay, though not great. At one point Mom and I were swimming back to the boat and we heard this resounding BOOM through the water. We couldn't see anything that could have made the noise, and our only guess was that some fisherman was bombing fish around the corner. Perhaps the only reason the snorkeling was good there was the nearby pearl farm. Though there weren't any big fish at all. In Riung we did a fun bus tour with the 'kid boats' Anon and Vagabond Heart. The rest of the rally was going on massive busses to most of the same places, but we wanted to be able to control where we were going and what we were doing. Mom and Debbie from Vagabond Heart bargained for a bus trip to where we wanted to go... at first the driver said it would take 13 hours, and when they said that was too long, they said 'Ok, ok, 8 hours'. Much better. We drove past some (rather dry) rice fields for several hours and ate lunch at the biggest inland town, Bajawa. Then we drove to a new volcano for a hike up to the caldera and a nice view as the clouds came rushing in. The volcano was Wawo Muda, the newest volcano on Flores - it erupted in 2001 and left behind several reddish lakes. While we were up there, one of the kids dropped a massive rock down the hillside we were standing on. When it bounced it made a sound like a drum, like the whole hillside was hollow. Creepy. 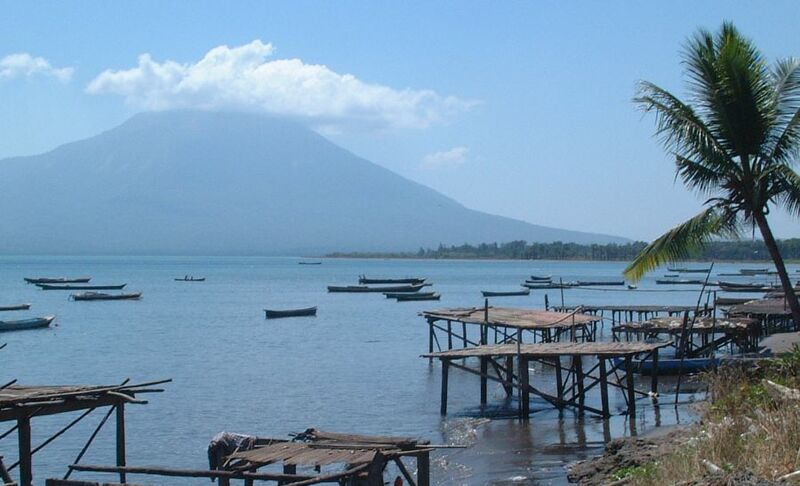 From there we drove past Gunung Inerie, a perfectly conical volcano, to a little traditional village called Bena. There we saw, well, a traditional village. Each family had a house. There was a communal area in the middle, and graves dug into the terraces. Four male (conical) and female (square) shrine-type structures were in the center of the cleared area, representing the continuing presence of ancestors. Hung up on the chief's house was a collection of buffalo horns. Old blind, toothless women sat on porches, chewing red betelnut. Younger women brought out home-woven ikat for us to look at and buy. By that time it was getting dark, and we had to leave. It was a four-hour drive back to Riung, plus we stopped for dinner. I think most of us fell asleep on the bus. At one point, at the top of a steep hill, the driver suddenly stopped and ran out of the bus, jerking us all awake. "What's going on? What happened?" we all cried, until we realized the driver just had to take a leak. (Jon) I had absolutely no idea what to expect of Indonesia, which was probably good as it made me approach it with a more open mind. With a country that spans several thousand miles in each direction, containing several hundred distinct ethnic groups, Indonesia is even more impossible to define than the US. When we got to bustling Kupang, with its Bemo busses, sprawling light industry, and Muslim calls to prayer several times a day, I thought perhaps it would set the pattern, but in fact we didn't see another town nearly as big until we got to Bali, over 600 sailing miles and almost 2 months away (although we were often awoken in the early morning by an atonal cleric yodeling into an over-amplified and badly distorted microphone, and even got to enjoy it - think of Tarzan swinging between the trees and yelling his famous call while having a wisdom tooth extracted). Sue with local fishing families. Her Bahasa paid off! The rest of East Nusa Tenggara that we visited was much less developed than Kupang, with roads and other infrastructure dwindling dramatically at the outskirts of town. Perhaps Indonesia puts more of its development efforts into Java and Sumatra, because there isn't much infrastructure in Timor or Flores (or even Sumbawa). Roads get narrow and rutted, eventually dwindling to dirt tracks, while electricity is almost non-existent and community wells are commonplace. Still, the scenery is dramatic with tall volcanoes always in sight, some of them obviously still active. There are extensive reefs along the coast, but unfortunately the extensive over-fishing (sometimes using bleach, cyanide, or even explosives) have pretty well decimated most of the fish. I hope that Indonesia can educate its people to balance making a living with having a more sustainable harvesting of fish. The cultural dance shows that we were so looking forward to were delightful to watch, partly because they lacked the polish of, for instance, the Balinese dance shows (which we saw later). The East Nusa Tenggara dance shows often used improvised instruments or costumes, but depicted more of the culture of today, whereas we thought the Balinese dances depicted more the culture of a bygone era. 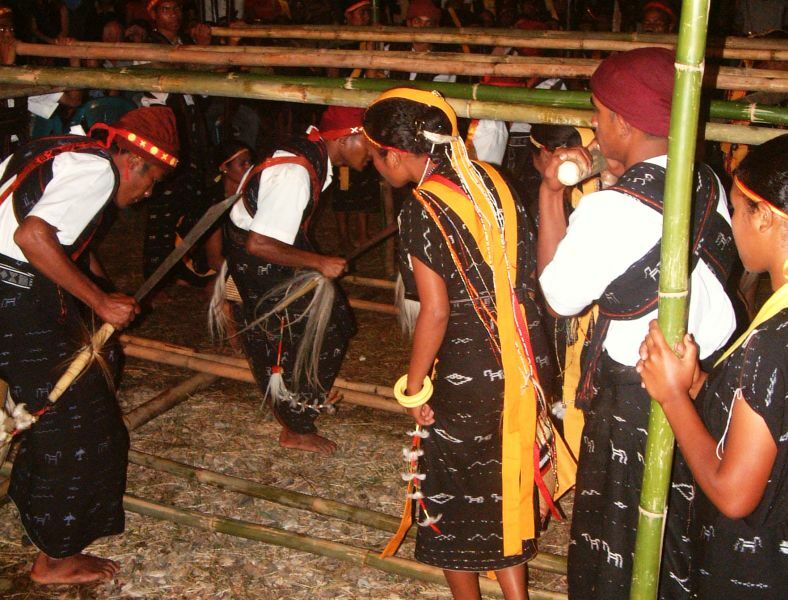 In Riung, the dancers wore tribal ikat (traditional woven cloth) and did intricate moves to drum beats. In our favorite dance the villagers held long bamboo poles to create a 3-D web through which the dancers had to move while the poles were rhythmically clashed and banged together. A mis-step could be disastrous!